Geothermal Heat Pump Installation and Repairs in Virginia | Atlas L.C. The heat pump that addresses all your fears about ground source and air source heat pumps. Yes it’s finally here. The GroundhogTM is our new geothermal heat pump combines air source and ground technology to produce a superior geothermal/air source combination heat pump system. While we have over 30 years experience installing and repairing a wide variety of home comfort systems, we've found that the products that Amana offers are simply some of the best in the industry. See for yourself. No matter where you live, the underground temperature remains relatively constant all year, even though outdoor temperatures may vary widely. 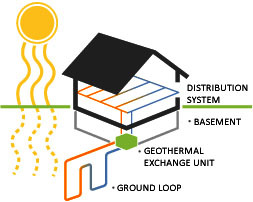 Geothermal systems utilize this stable resource as a renewable energy source for your home. Atlas offers an optional desuperheater, which is a secondary heat exchanger that transfers heat from the Groundhog into your domestic hot water tank. The device provides supplemental hot water whenever the Groundhog is heating or cooling your home. The hot water circulator pump moves the cold water from the bottom of your hot water tank through a water pipe to the desuperheater itself. The water is then heated and sent back into to your hot water tank. Atlas L.C. 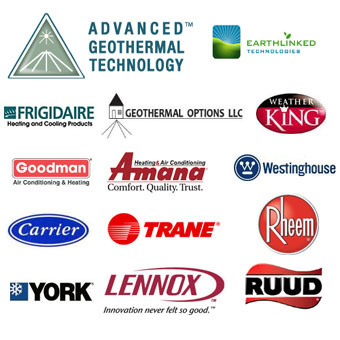 Heating and Air Conditioning has been designing and Geothermal heat pump system installations in Fairfax and Loudoun counties and custom heating and air conditioning systems in Northern Virginia since 1986. 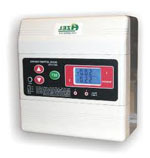 We install these systems in everything from commercial office buildings to single family homes. We specialize in installing heating and air conditioning units where no previous systems existed. If you have been told your home cannot have central air or heat - get a second opinion from us!! !